Fusion FIT is the first Fusion to use a skin specifically designed to fit women properly. Anatomically correct panels constructed out of super stretch neoprene ensure maximum streamlining and mobility. Gator tech armour on the knees and reinforced seams ensure maximum durability. 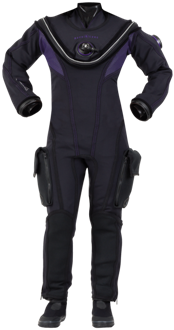 The Fit Skin attaches and removes easily from the Dry Core by Velcro fasteners at the wrists, ankles and zippers.